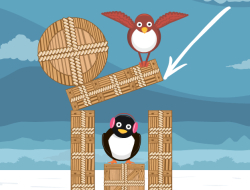 This is a fun skill game in which you will see something that is hard to believe, some penguins flying. Dont worry as they arent flying by themselves but some birds are carrying them in their claws. To successfully make the penguins fly you must tell the birds what to grab. Sometimes you can just grab the penguin, but otherwise you need to clear the way so they can have a clear path. Use the cannon to shoot the penguin away from danger and dont be worried as it will not hurt them one bit. Flying Penguins 0.00 between 0 and 10 based on 0 votes.